Offered here is a NEW reproduction of a vintage WRESTLING POSTER from the late 1960’s. From a match at the San Jose Civic Auditorium in California, Midget Girl Wrestling headlines the bill with DIAMOND LIL and LITTLE DARLING DAGMAR. Awesome graphics and nostalgic memories from the world of professional wrestling. Measures 13″ x 19″ and would look slammin’ in a frame. Makes a great gift for wrestling buffs and drop-kickin’ hipsters alike! Categories: NEW MERCHANDISE, MISC, PAPER PRODUCTS, POSTERS & LOBBY CARDS. 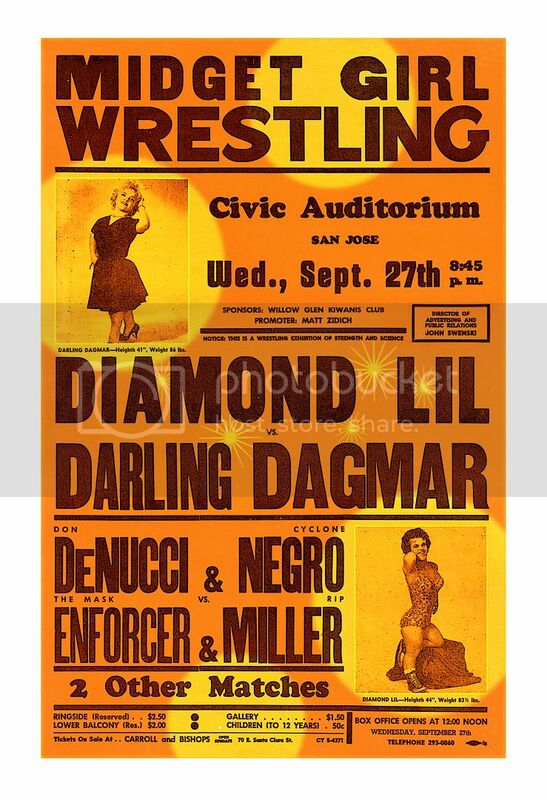 Tags: collectibles, Darling Dagmar, Diamond Lil, Midget Girl Wrestling, San Jose Civic Auditorium, sports memorabilia, wrestling posters, Pop Culture. Be the first to review “Vintage WRESTLING Poster (2013) Midget Girl Wrestling” Click here to cancel reply.